I have not seen this book in the UK, will have to research the title as it looks interesting. 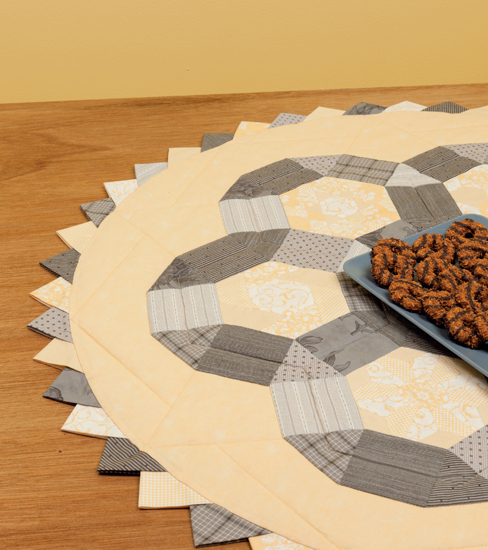 I have made several hexagon projects, one a King sized quilt. Hexagons are portable, addictive and provide a conversation piece when travelling! 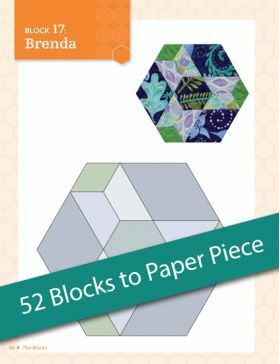 This book is all about paper piecing. The first 13 pages are about techniques, tips and how-tos. Tips are set off in colored boxes. Maybe a better name for English paper piecing would be Applique with Stabilizer. The English paper piecing is simply cutting out paper templates, applying them to the wrong side of your fabric, folding over the raw edges and then appliqueing them in place. Once you are done, you remove the paper. The paper gives you a “ridged” form to work with. 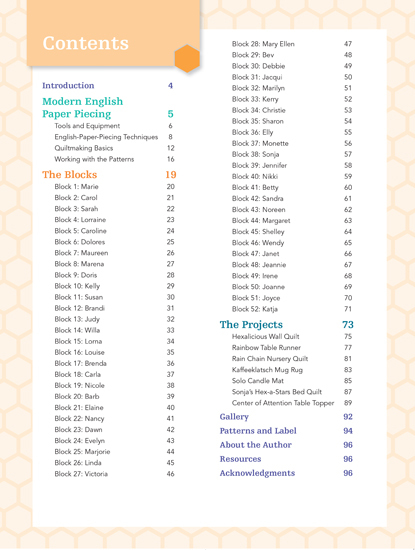 There are 52 pages of blocks. Each page has the form and then a photo of the finished block. 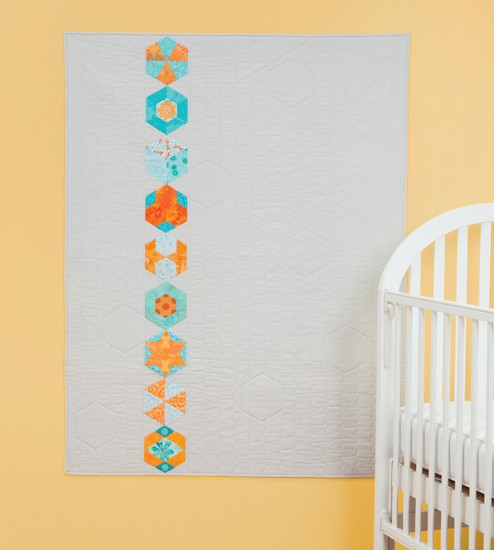 There are seven projects which include two quilts, two table runners, a candle mat and a mug rug and finally a baby quilt. The instructions have a colored photo of the item, a paragraph about the item in a colored box and the required material and cutting lists. 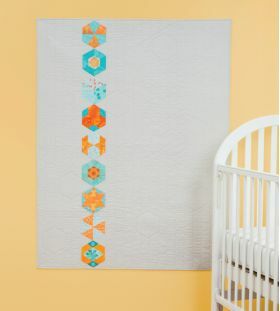 There are just a few graphics with the written instructions and there are no specific quilting instructions. The final pages of the book include templates and a tag pattern. 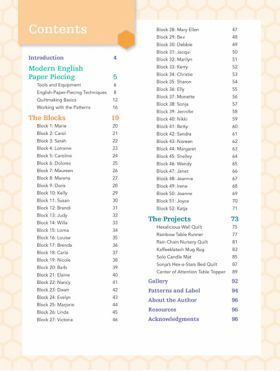 One page gives the author’s bio, resources and acknowledgements. I am totally new to English Paper Piecing. The instructions are clearly written, and it was a pleasure to read through this book. Having such large variety of blocks is a delight. One could really do a lot with this book. 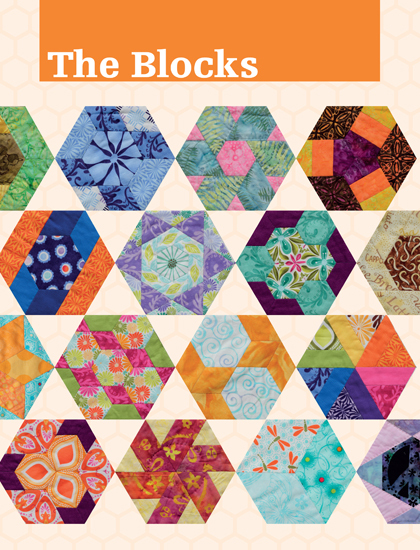 Love all the modern hexagon blocks Katja's book offers and her clear instructions on how to make them. Such fun designs, and so many possibilities! 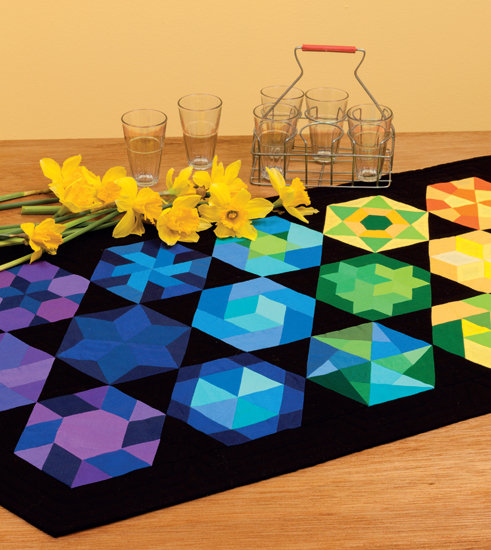 I love how Katja has combined the traditional Hexagon pattern with English paper piecing with a modern twist. 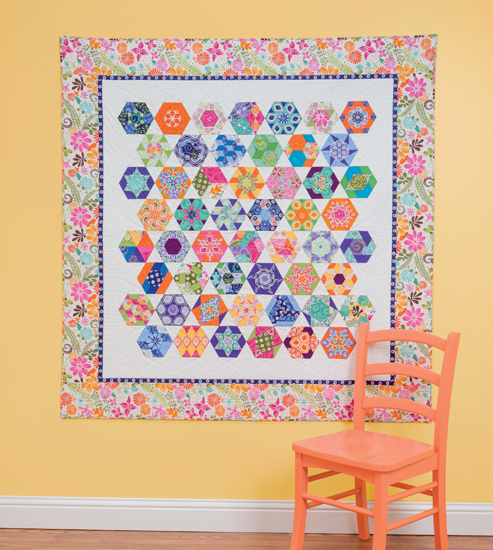 With her easy to use methods on a traditional idea, makes creating Hexagons so much fun. You will be creating your own patterns in no time using Katja's simple techniques. 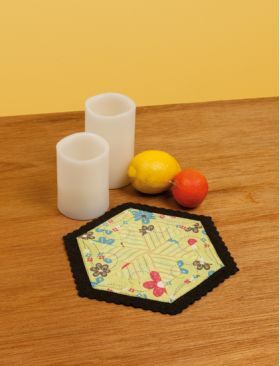 You will find many more tips and ideas to inspire your passion for Hexagons. Excellent book, I am hooked. I so appreciate the careful instruction Katja uses throughout the book. These blocks are over the top. I really enjoy EPP and am currently in a EPP group at Quilter's Junction in Centralia. We are having a great time learning new techniques and tips from members of our group. Katja has given us an opportunity to expand our Hexie knowledge. Look forward to having her book in my book collection. Would love to have this book, looks like a real winner & place to start a collection. I have made 26, 6" english paper pieced hexagons. I guess that makes me an experienced piecer?? I enjoyed the process, and found hand piecing extremely relaxing! Looks like Katja's book is going to be a keeper in my library! Katja Marek quite rightly points out in the introduction to her book that English paper piecing, whilst a popular mainstay of quilting, can be extremely time consuming. However, modern techniques and tools can certainly speed up the process, and make pleasing results obtainable in a fraction of the time. 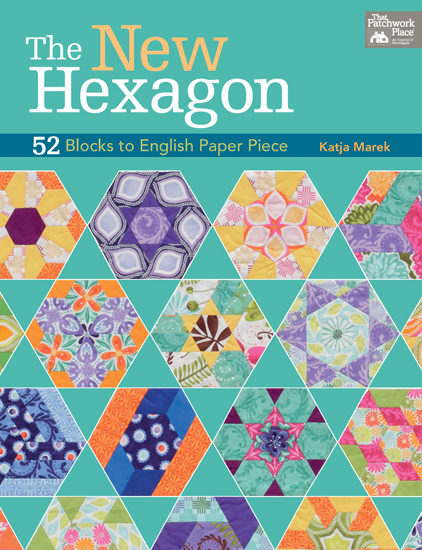 The New Hexagon features 52 blocks to piece, with a huge variety in styles, techniques and colours, and the author encourages readers to experiment with other techniques like fussy cutting to add further variety. There are several beautiful projects included, too, and a gallery of some finished pieces for even more inspiration. 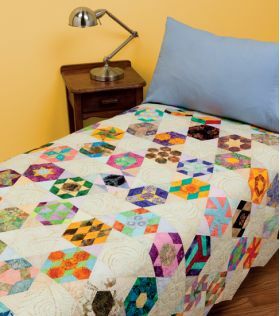 The book provides step-by-step instructions and goes some way to proving how versatile, attractive and modern English paper pieced quilts can be. As a fitting and serendipitious nod to the start of a new year, this is one of three books this month to feature 52 separate pieces - so you can have something to make for every week of 2015 if you're determined! I love it when I find a Canadian author to review. Katja has a quilt shop in Kamloops, BC, and has written this book including 52 patterns for six-inch blocks. It seems to me there is a renewed interest in English Paper Piecing and Katja has updated the method with today's tools. The projects included range from a mug rug to a bed-sized quilt. 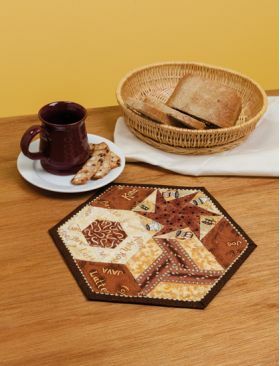 If you wanted to try your hand at English Paper Piecing, you could start by trying a mug rug or candle mat from her patterns. There are numerous images from the book on her website that will give you a better idea than my words will. Check it out!